This past week, I received certification from Special Needs Group, Inc., a global provider of wheelchair rentals, scooter rentals, oxygen rentals and other special needs equipment rentals for the travel industry. Recommended by the world's major cruise lines for superior service and value, Special Needs Group also services guests visiting hotels, resorts, theme parks and convention centers. To earn the distinction, I participated in Special Needs Group’s in-depth online 3 module certification program. Through the program, I gained an understanding of the special needs/accessible travel market. I also learned about the best equipment to rent for special needs travel. From mini refrigerators for insulin and patches of sod or mulch for a service animal, to organic baby food and pack-n-plays, I will make every effort to accommodate needs. One of the things I learned was that nationwide, one in seven persons has some form of disability, and one in five families are touched. Whether someone has cystic fibrosis, asthma, sleep apnea or other respiratory disease, travel is still accessible. By specializing in special needs/accessible travel, I have the ability to help this large percentage of the population travel in an enjoyable, safe and efficient manner. Through these courses, I not only learned how to assist individuals with special needs to enjoy travel, but I found some valuable new ways to serve the needs of all of my clients. The population, as well as the travel industry itself, has undergone major changes in the past few years. By completing this program, I have the ability to stay on the cutting edge of these changes and create incredible opportunities for my clients. To book a vacation or inquire about equipment that might be needed while away from home, please contact me. While the temperature cools down to 56 degrees here in Florida, I'm at my desk with a long sleeve shirt, a zipper sweater, flannel pants, and slippers. But my mind drifts back to November when I personally witnessed the white sand beaches and beautiful blue water at Sandals Emerald Bay. 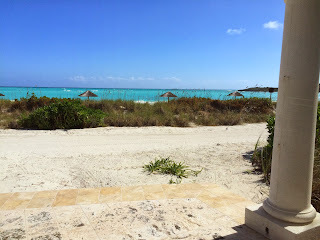 Here are 5 things you didn't know about the sophisticated, secluded Sandals Emerald Bay, in Exuma. 1) Greg Norman (aka The Great White Shark), designed Sandals Emerald Reef Gold Course. The 18-hole, par 72 championship course weaves through dunes, scenic mangroves, and the peninsula of Emerald Bay. 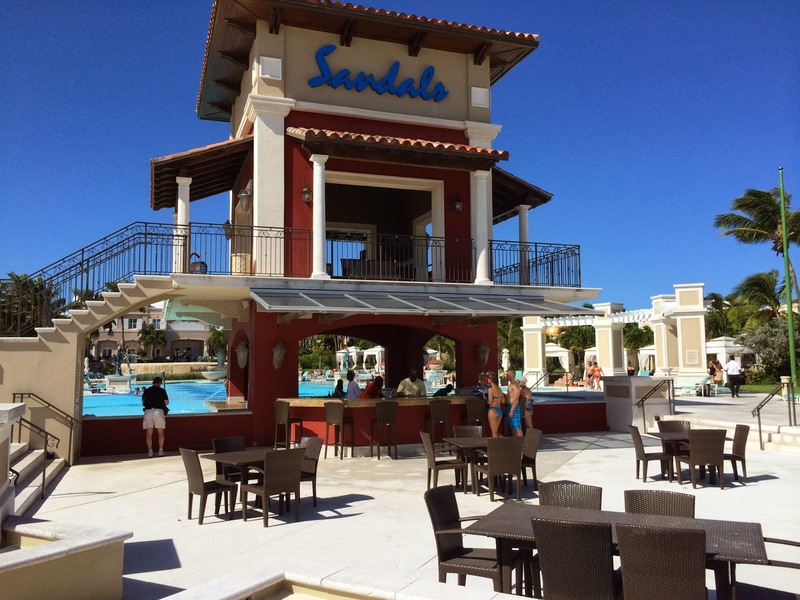 Sandals' guests green fess are $175 per round. Sandals currently has an offer where guests staying in the exquisite butler service suite for at least 4 nights receive the ultimate golf package free. This offer ends December 31, 2013. Check with your travel agent for more details. 2) You can get a direct flight to Exuma (GGT) from Nassau, Miami, Atlanta, Ft Lauderdale or Toronto. Or you can fly your private plane, but be aware, it has one 7000 x 150 foot runway. The airport is small and quaint and welcomes its visitors with a warm, tropical hello. After an approximate 10 minute drive, you arrive at the ultimate, all-inclusive resort, where 1 1/2 miles of blissful beach await. 3) With a world of flavors offered at their 7 dining options, my clients often inquire about the attire for the restaurants. There are two types of attire: resort casual and resort evening. Resort casual means you can wear shorts or jeans, t-shirts or polo shirts. Swimwear must be covered, and shirts and footwear are required. Resort evening requires dress pants or jeans for men, long or short sleeved dress shirts (with or without collar) dress shoes or elegant sandals. No shorts, t-shirts, sleeveless shirts or tennis shoes/sneakers. For dinner, at this resort, evening attire and reservations are required at II Cielo (the sky) and La Parisienne. The nightly themed buffets also require evening attire. Casual attire is appropriate for the other dining options. 4) Emerald Bay offers weekly themes and events. These are perfect team building and corporate functions. 5) World Travel voted Sandals Emerald Bay "Caribbean's Leading Luxury All-inclusive Resort" 3 years in a row. My favorite accommodation was the Prime Minister Honeymoon Beachfront Walkout Butler Villa Suite. Where else can you step out from your patio into the white sand beach? Along with your very own butler, elegance leads down the hall into a large living room which opens into the private patio. The view was absolutely beautiful. This is the extraordinary place to be to celebrate a honeymoon or anniversary. 6) I know I said 5, but did you know Emerald Bay was also voted the "Caribbean's Leading Conference Hotel?" Get in touch with me for more information on their conference center. 7) And one more thing...Did you know that in Exuma, Fowl Key, you can swim with...pigs? Charming! Adorable! Historical! There is something special about Mount Dora, Florida. USA Today writes, "Dora exudes a comfortable Southern charm and hospitality." Visit Florida boasts, "Mount Dora offers you the pleasure of Old Florida country living." My travel agency is located in downtown Mount Dora. Everyday I get to experience the peace and serenity of the town itself. But what's even better is making connections with the local business owners, the residents, and even the visitors. Food! Gifts! Snacks! Antiques! Entertainment! Recreation! Nature! Events! Festivals! Shows! The list goes on and on. If you're looking for something different, Mount Dora is a place you need to experience first hand. For additional information on Mount Dora visit the Mount Dora Chamber and www.whattodoinmtdora.com. If you need a place for a family reunion, a girl's getaway, a wedding or special event, please contact me. I'll be happy to arrange the details. That's what I do. I'm the travel secretary that you don't have to pay. What are your thoughts about Mount Dora?